Compressing or uncompressing files is an important feature in a web application. Suppose you are working on a web application that needs to zip or unzip files using NodeJS. 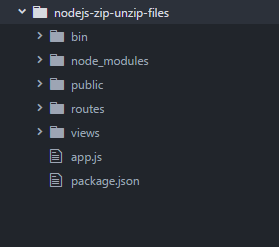 So this tutorial is going to explain how to zip or unzip files using NodeJS. In a previous tutorial we explored how to Zip, save and download files using codeigniter. In this tutorial following tasks are going to be performed. 1. 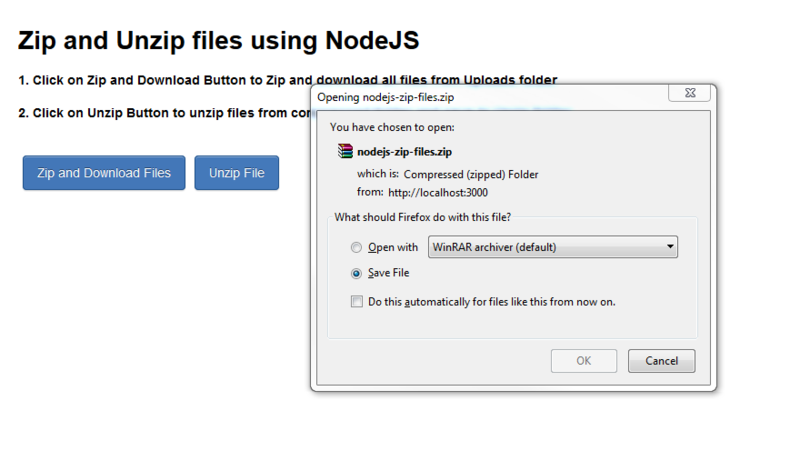 Create an application to zip or unzip files using NodeJS. You can view the app below. Express generator installs express tool to generate a skeleton for NodeJs Express application. After express generator installation. Type following command on command line to generate a NodeJS, express application. Here pug is used as template engine in view files. This command will generate an application named nodejs-zip-unzip-files. Next type cd nodejs-zip-unzip-files && npm install command to install dependencies in node_modules folder in project. We need a folder and some files inside folder to zip. So open public folder and add a new folder named Uploads, This folder contains files to be compressed. Add some images or text files in this folder. Open command line, go to project folder, and install express-easy-zip node module. This module is used to zip or compress files. Open project in your favorite IDE such as Sublime text, Eclipse or brackets. Open index.pug file inside Views folder. Add code below to this file under block content. Also you need to update the style.css inside stylesheets folder under public directory. Open index.js file in Routes folder. Inside ‘/’ route. Change title of page var title = ‘Zip or Unzip files using NodeJS’;. Now add a new route /zip. Add following code inside the file. First uploads directory inside public folder is assigned to dirPath variable. Then res object’s zip method is assigned a files array. Inside files array an object is passed. In object we passed a file contents dynamically with its name, mode, created date and type. This file named test-file is going to be compressed. Next a folder uploads with full path is given. Contents of this folder are going to be compressed. Lastly name of zip file is given. Now open browser and type following URL is address bar. You can view our application running on port 3000. When user clicks on Zip and Download Files link button. /zip route is executed. 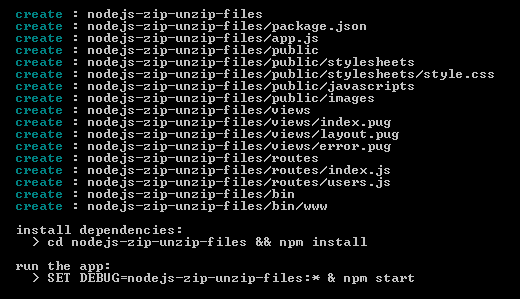 To unzip a compressed file contents, first you need to install unzip NodeJS module. Unzip module uncompresses a zip file contents. Open command line, and type following command. Next open index.js file in routes folder, Add line below. Add following code inside it. Consider streams as objects. These objects can read data from a source and write data to a destination continuously. A stream can be readable to perform read operation, writable to perform write operation, duplex to perform both operations or a transform. A new route unzip is added in index.js file. Inside route, path to an already compressed zip file is added. Zip file is inside compressed folder under public directory. Next path to unzip folder is added, where compressed file contents will be uncompressed. Lastly using fs module, a read stream is created using createReadStream. Inside readStream zip file path is given. readStream reads the contents of this file and passes to pipe stream. Pipe stream takes input from one stream and pipes it to unzip module’s Extract method. Inside extract method destination path is given. File is unzipped in destination folder successfully and user is redirected to ‘/’ route. 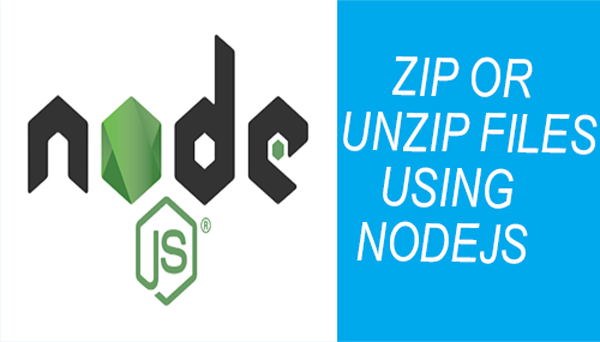 In this tutorial you have learned how to zip or unzip files using NodeJS. Zip and unzip modules were installed and compressed files inside uploads folder. Then uncompressed a zip file present inside compressed directory. You can download source code from this link. Leave your feedback or comments below. Please follow us on twitter or subscribe to our newletter to stay informed about upcoming tutorials.